Today we had our first two performances… The first was at a small coffee shop and the second was at the Alliance Francaise Cultural Center as today was World Music Day and they were having whole bunch of different bands performing. As the coffee shop gig was the first real performance for “De La Paz”, we used this time to work out the kinks. Overall, everything came out really well. About half way through, I ended up taking over the sound board as the resident sound guy was having some difficulties. Though I have no experience as a “roadie”, all those years of tinking up home theater systems and surround sound audio really came in handy for getting the right mix in place… Four Vocals, Two Guitars, and Keyboard… Not too shabby for my first run at it! 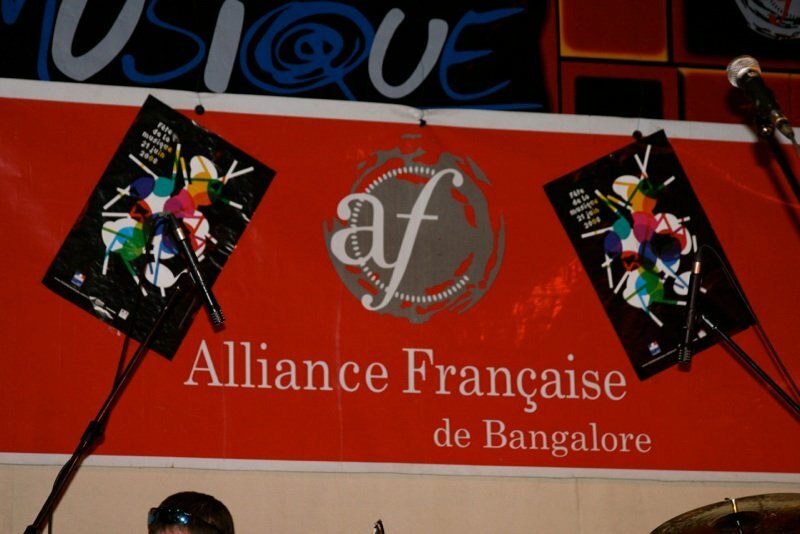 At the Alliance Francaise, the setup was much more official and the crowd was totally into the set. Since this was a more mainstream environment, most all of the songs we did were in the Coldplay, Snow Patrol, John Mayor genre. All together, the band sounded great and we even made some friends. Hopefully, we’re going to be able to put together a jam session later this week. After our second performance, we headed to dinner and then directly home as everyone was beat. I was in bed by 8:30 pm and up at 5:15 am. Unfortunately, the internet has been down all night. Not sure what the story is here.